On Sunday mornings I have a very early start, and am regularly awake by 5am, so this morning I was already up and watching the news when Tokyo was announced as the winning bid to host the 2020 Olympics. I watched the Japanese delegation in Buenos Aires jumping up and down, the scenes of jubilation from the arena in Komazawa Park, built for the 1964 Olympics, and I thought . . . well, I thought a few things. I have quite mixed feelings about it. The Japanese bid had focused on being a safe choice: ‘the Olympics will be safe in our hands’. But what does ‘safe’ really mean? First of all, the statement that I think most people would agree with, that Tokyo is generally a safe city for tourists and for residents. There are clichéd stories of people losing valuable items and getting them back, but it really does happen. Wallets, purses, mobile phones – drop something in the street, leave it on a train and if you go to the police box or station office there is a high chance that you’ll get it back. Not every time, but a lot of the time. ‘Japan is safe. Abroad is dangerous.’ (日本は安全、海外は危険) Cut and dried, black and white. No more to say. Of course, it’s not that simple, but with the exception of a few places, I would go anywhere in Tokyo at any time of day or night, on my own, and I would feel safe. I often walk home from the station at ten or eleven o’clock, listening to my iPod, and I don’t worry about being safe. I wouldn’t do the same in the UK. I go out and leave my windows open, and in fact left them open while I was away all summer. I leave windows open at my mother’s house in the UK, but she lives in a village and even that is against recent police advice and know friends and family in cities who lock everything before they go out. I have friends in rural parts of Japan and even Tokyo who never lock their doors. Japan is safer than many, if not most other countries. Japanese citizens and residents who have got used to life here need to remember that when they travel and be more cautious, but the idea that someone is imperilled the moment they step off the plane in another country is not true. So, Tokyo will be a safe place to hold the Olympics. Visitors can be generally assured of their personal safety. Yes, I will give them that. Generally, that is a truthful statement. Next, the Tokyo bid claimed to be a safe (reliable) city which could be counted on to complete construction on time, to have a mass transit system capable of moving huge numbers of people from A to B. Again, I would give them that, but the way it was highlighted left a bad taste on one memorable occasion. At the end of April, Tokyo Governor Naoki Inose cast aspersions on Istanbul’s bid in the most general and unpleasant terms, when he criticised Islamic countries (yes, all of them), saying, “The only thing they share in common is Allah and they are fighting with each other, and they have classes.” He was slapped down by the International Olympic Committee, who said that cities bidding for the Olympics should not make negative comments about rival bids. Governor Inose apologised, first claiming that he had been taken out of context (that old chestnut) but then acknowledging that his remarks had been ‘inappropriate’. That was the end of the story. This is probably the subject for a separate blog post, but it does seem to me that Japan doesn’t ping the international radar with its unsavoury behaviour, and I wonder why. Maybe Japan seems non-threatening, not a country that could pose a threat, but anyone who knows about the rise of militarism here in the 1930s knows that’s not true. But back to the second idea that Japan is safe, meaning reliable, will have everything ready on time, and be able to move everyone around the city efficiently. Yes, I will give them that too, but how much will it cost? The Japanese economy has been stagnating since the bubble burst in 1990, and the gamble seems to be that massive construction will boost the economy and a fat profit will be made. In the meantime, the taxpayers of Tokyo will be picking up the bill. Finally, the aspect of Japanese safety that has been in the news a lot in recent weeks: Fukushima. The Godzilla in the room. Two and a half years ago, a tsunami slammed into Fukushima Daiichi nuclear plant, and three of the six reactors went into varying degrees of meltdown. The hapless, incompetent and arrogant Tepco (Tokyo Electric Power Company) has been trying ever since to get on top of the situation, while running rings round the government and anyone else trying to get an accurate picture of what is going on. Now it seems they never really got their act together and since last month the facts and figures finally emerging have painted a very scary picture. Water contaminated with radioactivity is leaking into the Pacific, and into the ground around the plant. It has reached such high levels that anyone exposed to it would die within hours. Yes, well, boo to that, Mr. Abe. That’s not so far away from Tokyo, and while I know it’s Tokyo which will host the Games, I don’t think that’s totally the point. 150 miles (or 240km) away from Tokyo there is a serious, ongoing nuclear incident. The most serious since Chernobyl. There is an exclusion zone around the plant, a dead zone, and who knows if people will ever be able to live there again? The spent fuel rods were, last time I saw any information about them, 4 storeys up in a damaged building, in a tank of water, exposed to the elements, covered with blue tarpaulin. The plans to sort out this mess are measured in terms of years, apparently lacking any sense of urgency. What would happen if a typhoon hit the area? Or another earthquake and tsunami? It seems to me there is a lot of gambling on what probably won’t happen, and politicians making statements about scenarios that will ‘never’ happen. But can they really give such absolute guarantees? After the earthquake and tsunami in March 2011, the number of tourists visiting Japan fell dramatically. Despite assurances, people didn’t want to risk it. There are some words which people react to on a very instinctive level. I would suggest that those words would include ‘earthquake’, ‘tsunami’, ‘nuclear meltdown’, ‘radiation’ . . .
150 miles or 240km. Does that sound like a great distance? In the UK that is the equivalent of London to Chesterfield or Cardiff, and in the US, Washington DC to Philadelphia PA, or Baltimore MD to Richmond VA.
Do you still feel safe? Would you still feel confident that people will travel here and happily ignore the risks? We’re not talking about vast distances here. Underneath the declaration that Tokyo is safe there is so much more information, so many more aspects to this. Facebook has lit up today with a wide range of opinions. This is in no way anything other than anecdotal, but from what I have seen, opinions range from a straightforward, ‘Yay for Tokyo, that’s great!’, to ‘Oh no, Tokyo shouldn’t have got it’. There are a lot of mixed feelings, and that is where I find myself. I am proud of this city, I love so much about it, and I’m excited that Tokyo will have an opportunity to showcase what’s great about it, that people will come and have an amazing time. That certainly happened when Japan co-hosted the 2002 Football World Cup. But, but, but . . . how much will it cost? Will it make an already emboldened, aggressive and increasingly xenophobic government even bolder? Some have pointed out that Mr. Abe probably won’t be the Prime Minister, that this current crop of unpleasant fellows will not be in power. True. But the LDP has been in power for most of the last seventy years, do you think that’s going to change? It won’t be Abe & Co. in power, but in the tradition of generations of political families here it will probably be their younger brothers or sons. 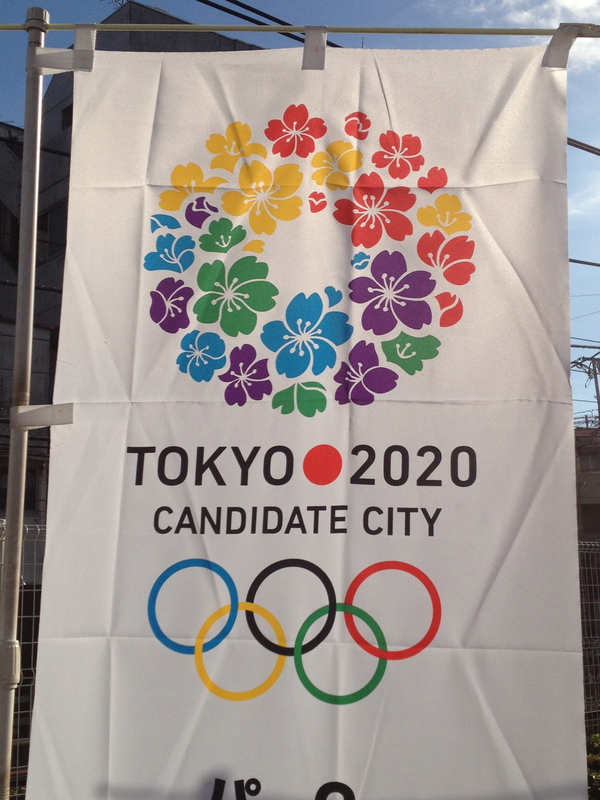 I do hope that the 2020 Olympics will be a wonderful opportunity for Tokyo. I really do. But I also hope that for the next seven years, there is a spotlight on Japan, that the rest of the world watches what Japan’s leaders say and do, that they are held to account, and that they deal with the situation in Fukushima sooner rather than later, not just for the Olympics, but for all the people in Tohoku who have already endured two and a half years of Tepco lies and government ineptitude. This entry was posted in Tokyo 2020 and tagged Article 9, BBC, Fukushima, Great East Japan Earthquake, Komazawa Park, March 11th 2011, Naoki Inose, Olympics, Shintaro Ishihara, Shinzo Abe, Taro Aso, Tepco, Tokyo, typhoon on September 8, 2013 by tokyopurplegirl. Japan has four seasons. The rainy season is called a season, but does not impact the fact that Japan Has Four Seasons. A vehement shaking of the head. In winter we remind each other as often as we can that it’s cold. Yes, it’s cold today. It was cold yesterday. Yes, it’s cold. Is your country this cold in winter? Well . . . probably a little colder, but then, we do have central heating, and that makes getting up in the morning a completely different experience. The rainy season . . . it’s raining. Yes, I know, it’s the rainy season. Oh, the humidity has started. It’s humid today, isn’t it? Is your country humid? No, not like this. Ah, I thought so. Now, I know that this is an important part of social interaction; we exchange non-threatening small talk about the weather, we agree, we feel better for having agreed and we go on our way. But in all this, I am reminded of a scene from years and years ago on Fawlty Towers, when Sybil is badgering Basil about something, and he goes away muttering about Mastermind, and ‘Sybil Fawlty, subject, the bleeding obvious’. I do realise that if you’re not British I may have lost you with that last cultural reference, but anyway, moving swiftly on . . .
It’s hot. It’s humid. And while we may be taking part in the great social interaction and confirming widely-believed facts, part of me wants to say, yes, I know, and talking about it just draws our attention to it, surely? Except, I am feeling so wrung-out in the heat that I don’t have the energy to point that out. It’s hot and humid, did I mention that? Just as in winter, there are a number of nifty little ideas that Japanese people have used for many years to try to keep cool. Of course, most people have air conditioning at home, and certainly in shops and on trains the AC is quite ferocious, but there are other ways to try to keep cool too. Wherever you go you will see people fanning themselves. Many people carry a folding fan in their bag or pocket, shops and other businesses often give out the non-folding type as promotional goods, and where neither are available people will use whatever they have to fan themselves; a book, a newspaper, a small towel or their hand. I first starting using a fan in summer when I lived in China, and remember taking several back to the UK because I liked the designs so much. Once I put one in my bag and on a particularly hot day pulled it out to use it and was met by incredulous looks from the people around me. I put it back in my bag and decided that was behaviour best confined to Asia. These days I have a fan in my school bag, one in my handbag, and at least one more at home. When my students pick up their textbook and employ it as a fan instead of the teaching tool it is meant to be, I don’t bat an eye. Go ahead, student! You keep cool any way you can. It’s hot and humid today, isn’t it? While almost all of us enjoy sitting around in air-conditioned comfort at home, conventional wisdom dictates that sleeping with the AC on is A Very Bad Thing. No good will come of it, you will catch a cold and we shall all roll our eyes knowingly. The appropriate way to sleep on a hot summer night is to use an electric fan, which is surprisingly effective. There are cooling ice pillows (‘cooling’ seeming to be an understatement, what do you think is going to happen if you sleep with your head on a giant ice-cold gel pack?) and the excellently-named towelket. This is the hybrid offspring of a towel and a blanket (I’m sure you’d already figured that one out for yourself), which you use instead of a duvet in summer. I must admit that I don’t use all these things; I have a fan, but sometimes I wake up around 4:30 when the sun is coming up and switch to the AC. No good will come of it, I’m sure. Summer in Japan also means insects. In most places you would think that that is obvious; hot weather bringing out all kinds of creepy crawlies which we dispose of in a variety of ways. If you’re thinking of mosquitoes and cockroaches, of course, we do the same in Japan. But there are other insects which are greeted with delight. Children go out looking for these mini beasts and carry them home triumphantly. Failing that, you can buy one in a department store, along with its own plastic box and the strange gel it likes to eat. 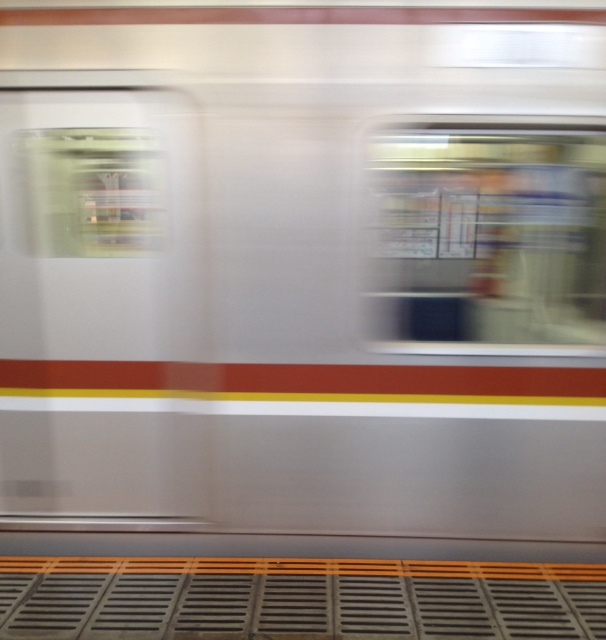 Last summer I was in Yamanashi on a school trip. 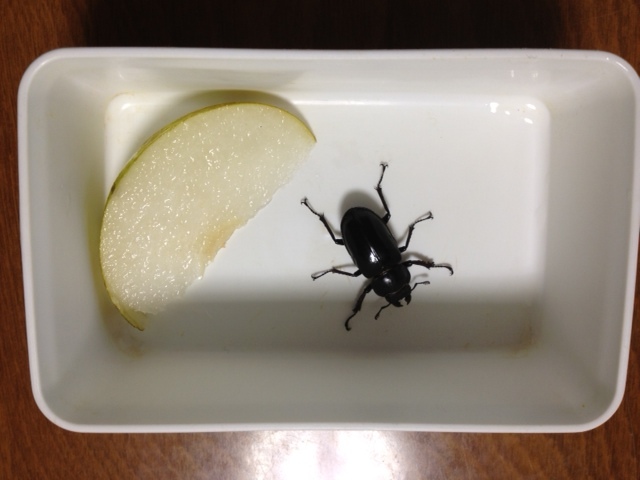 On the last day, the Japanese teacher and I found some kind of stag beetle which we knew her young son would like. Between us we picked it up, carried it back to the cottage we were staying in, put it in a plastic box with a slice of Japanese pear, gerry-rigged a net used to catch organic waste in the sink over the box to contain the beetle but allow it to breathe, secured said net with dental floss, and at some point on the bus journey between Yamanashi and Tokyo even named it. It made it back to Tokyo, where my colleague continued to feed it and tend to its needs for several days. It expired before her son returned from his grandparents’ house, but not before she had put considerable energy into its care. 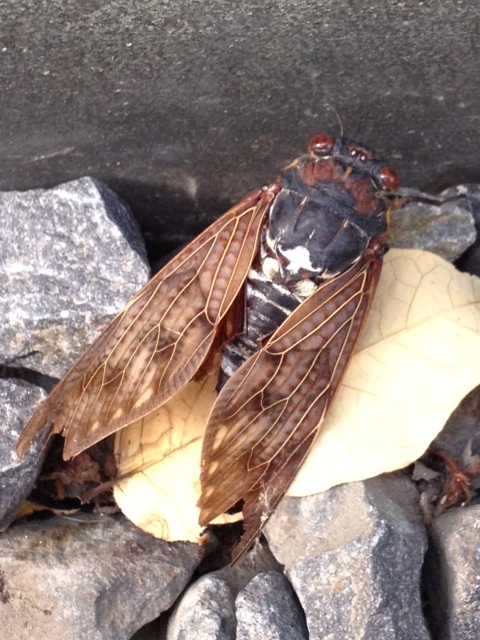 The cicadas also are an important part of summer, their incredibly loud noise being part of the soundscape. In the last few days I have heard the first ones start up, and they will continue until some time in September. Adding to the soundscape in my neighbourhood, of course, is my neighbour’s fondness for wind chimes. We have already had the great cacophony that is the full-on five-chime experience. Friends on Facebook have suggested a variety of remedies but since I do not possess Spiderman-like skills to scale the front of their house and make it up to the second floor to cut the things down, nor can I legally arm myself and take potshots at them (either the chimes or the neighbours) I can only close my windows, turn the AC on and try to ignore the sounds that I can still hear. How they find it relaxing I just don’t know. 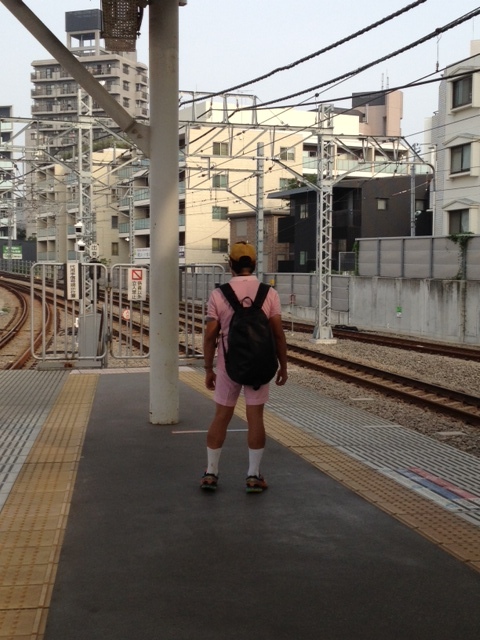 The are other traditional Japanese responses to summer. I was in the supermarket today and saw a lot of people buying giant wedges of watermelon. A mobile phone shop was tempting people to stop and find out about some new service by offering free bottles of ramune, a traditional Japanese soda. I saw variety packs of small fireworks on sale in a local shop, which seems to me to be all wrong, since fireworks to a British person mean November 5th, Guy Fawkes, baked potatoes and bonfires, but I suppose to American and French people do mean summer celebrations. There will be giant firework dispays put on by different wards in Tokyo over the summer and people will buy these variety packs to have fun at home, which again creates alarm in me, a British person raised on public service announcements every autumn about the dangers of fireworks and why you should be very careful with them at home. 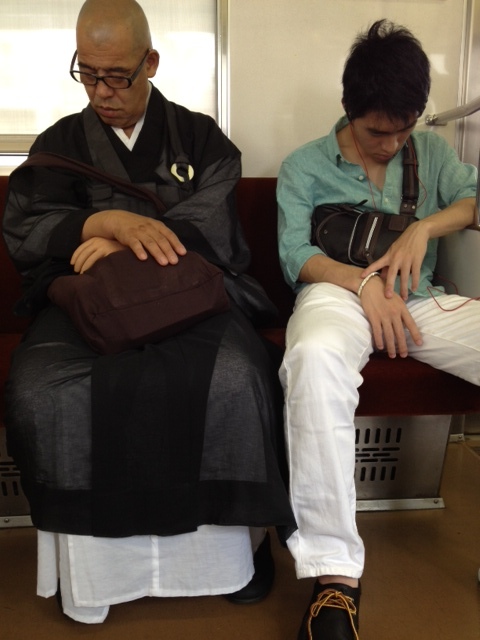 and today I sat across from this man as he snoozed gently. Here I sit in air-conditioned comfort (though I must say I am being ecologically responsible and have it set at 28 degrees). I feel a little hypocritical writing of the long, hot, humid summer stretching ahead of us, no relief until probably the end of September. I fly back to the UK on Tuesday. When I get back in August the heat, humidity, insects, will all still be here, but I will have a break from it all. But have you heard about the British summer? Sometimes it rains all the time and it isn’t very warm. Then again, it’s been too hot recently. But in my country? No, there’s no humidity, the insects are smaller and we certainly don’t keep them as pets. 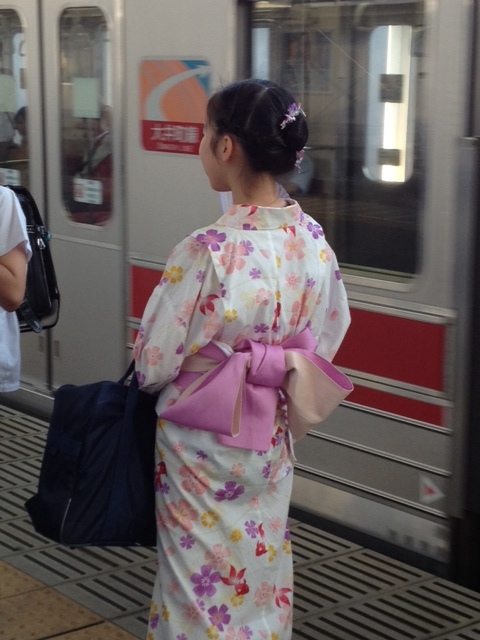 I am looking forward to my summer holiday, but I shall miss Japan too; my life is here. It will be good to have a break, visit family and friends, re-charge my batteries, remind myself again just how lucky I am to be European and be able to hop around to other countries easily. But it will be good to come home again. Wherever you are, I hope you have a wonderful summer. This entry was posted in Japan, Tokyo, Uncategorized and tagged cicada, Japan has four seasons, rainy season, ramune, summer in Tokyo, Tokyo, towelket, wind chimes, yukata on July 15, 2013 by tokyopurplegirl.